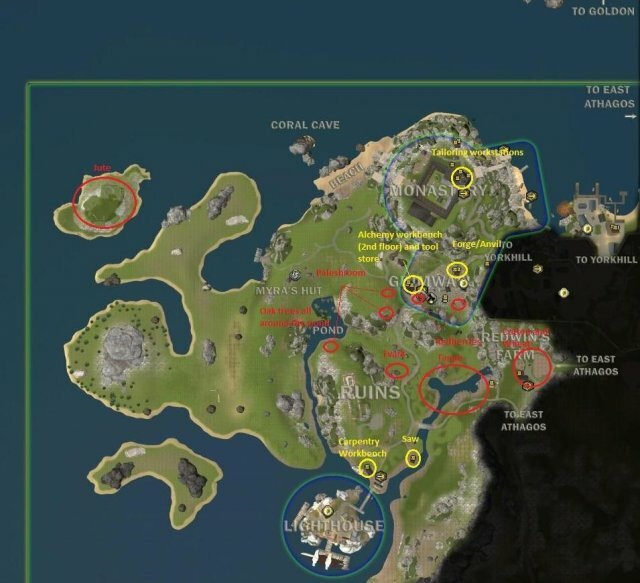 This guide explains basic ways to obtain level 55 in most crafting and harvesting skills. It does not currently include information pertaining to Fishing, Cooking, or Sailing. Ctrl + Shift will bring up the name of everything nearby on your screen. 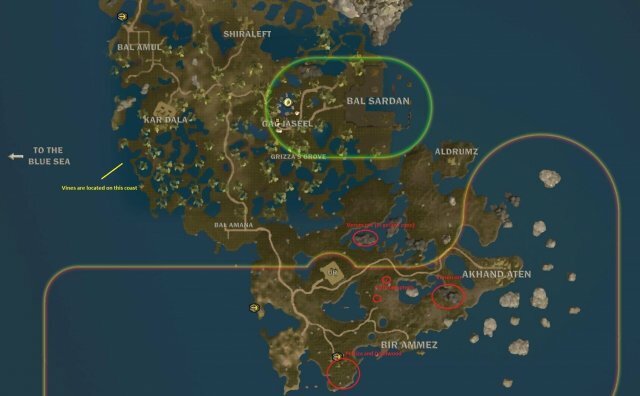 I recommend this when looking for spawn nodes in an area you are unfamiliar with. 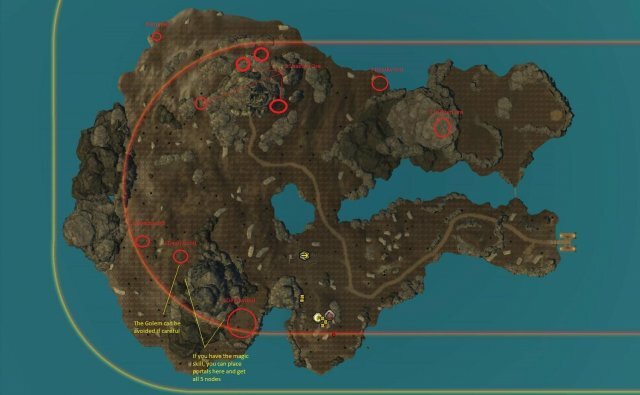 At the end of this guide are low-effort maps with nodes marked. 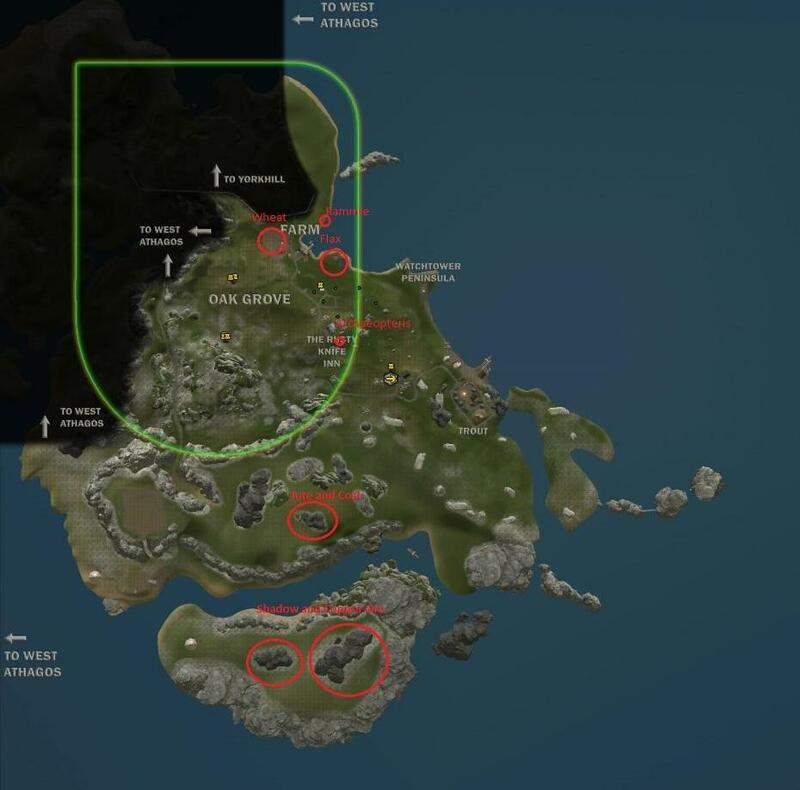 These maps do not contain ALL of the nodes, nor are they very detailed. They contain enough information in conjunction with this guide, as well as some level 55 resource locations. Save everything you harvest. If you are going to sell it, research it first to see if it has usage in another skillset. 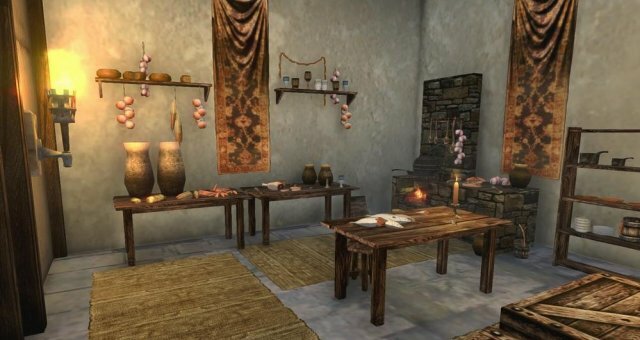 You do not want to sell 500 of something you gathered at level 1 only to find that you need it for a level 30 recipe in a different skill. My technique required leveling a harvesting skill to the next tier and then the supporting crafting skill to the next tier. For example, I leveled Alchemy by harvesting Jute until I reached the level needed to harvest Flax. I then took all the Jute and used it in Tailoring to bring it up to the next tier. I then went and harvested Flax, etc. The amount of materials gathered to get to the next tier *tends* to be enough to get the associated crafting skill to the next tier. Sometimes you need to harvest more of a substance or you end up with leftover materials. My recommendation is that you level 1-15 via Tanpe. This would have been useful when I was leveling Carpentry later on, as it is used to make bowstrings. Seriously, I highly recommend you go with Tanpe and toss it in the bank for later. However, I leveled this via Redberry and Paleshroom. Several levels in I decided to stop making potions with them and started selling the materials themselves in the Auction House - plus, I'd rather just gather for xp instead of craft. You could make the potions for additional experience and sell them if you want, of course. Jute. There is an island to the west with a massive spawn of Jute plants. A few nodes exist in Yorkhill near the player housing. There is also some in East Athagos. I saved it all in the bank for when I decided to get around to tailoring. I recommend doing this with all tailoring materials. Flax. It requires a sickle, which can be purchased at the tool store. I also saved this for tailoring. When I leveled this, East Athagos had a large patch of flax which now has some cabbage growing in it thanks to crop rotation techniques adapted by the locals. There is now a patch in Yorkhill as well. Note: For most of my leveling, I actually didn't smith items much apart from turning the raw ore into ingots. For example, while Stranite helped my mining level, I stuck with Verum all the way to 40 when I could smith Shadow ore. This is because turning the ore into ingots requires no additional materials. Also, for ore location information, check the Mining skill located below. I mined Iron ore, turned it into ingots, and then turned them into Iron Broadswords. I sold the swords to the vendor. I skipped dealing with steel because I hate having to mine coal. I advise that once you hit lvl 15, you save the remaining Iron ore and ingots for future carpentry leveling. Verum ingots. I had a small stash of copper I would use to make Verum Buckler Shields with, and sold them to the vendor. Once I ran out of copper, I just put made the ingots and put them in the bank. I skipped dealing with Stranite at level 25 because of the high coal cost to make the ingots, and I did not want to have to farm ghits for hides to make the armor when I can mine a load of ore in the time it takes to get a few hides to drop. However, if you want Stranite ore, it is in the Coral Caves in West Athagos. I turned Shadow ore into Shadow ingots. Oh how I have some choice words for this one! This was miserable. Important notes: Carpentry workbench is right next to the lighthouse bridge in West Athagos. You can take the traveling cart to the lighthouse and it is in a building right next to it. Also, the saw is slightly North of that location in what looks like a picnic shelter. Also, for wood location information, check the Woodcutting skill located below. Spruce planks. They require spruce logs at the saw. The planks are useful for a variety of things so I made them and tossed them in the bank for future usage. Oak planks - same deal as Spruce. Furniture: Small shelf - takes 4 Spruce logs. Furniture: Wooden large table - takes 3 Spruce logs. Furniture:Lantern - If you have any spare Iron ingots from leveling blacksmithing, now is when you want to use them. If not, you are going to be mining a lot for this next jump. There are two types of lamps, but they have the same costs and experience. At level 35 you can try making the Furniture:Candle Stand. However, feel free to just harvest more wood and make furniture. However, at the time there is no Evark furniture so the returns in experience will be low. Note: Palm trees are level 35 (Came out after I had level 55) - I have heard the are good for experience. I stuck with the lanterns the whole way, but I recommend you get a boat and head to the island in the Blue Sea. There is a sawmill there to make planks from as well. This may make 35-40 considerable easier. Deadwood Bow. That Tanpe you should have stocked up when leveling alchemy level 1-15? This is where you would want to use it. Of course, getting the wood was the difficult part -it took several thousand logs to get to 55. Since the palm tree has been released, they may be a better route than Deadwood. Vegetables. They are all over, especially near the monastery you started the game at. If you prefer Wheat, it is available at the farms in either Athagos. I sold my harvests because and didn't bother with the cooking skill as I figured I would use Fishing to level that up. Do what you please with the vegetables...except that, you filthy pervert! Cotton. I saved it for when I would level tailoring. Vines. They are along the middle of the western coast. I got them to make backpacks, and haven't bothered to level it beyond that. Iron ore. The stuff is all over, but this spot has a good concentration. Another spot is right outside the monastery You will obviously want to save it for Blacksmithing. I recommend just stashing it in bank and leveling all the way to 15 before starting on the smithing. You *can* start gathering Coal and Copper ore once you hit level 7 and 10 respectively, but copper does not yield much and has a longer respawn time. It can be found in a few nodes in the mine or the southern area in East Athagos. Coal is in various places but I never used it that much as for smithing I chose to level on ores that don't require coal in order to make ingots. I used Verum ore because I was going to train to 40 in smithing with it as it did not require coal after another player informed me of it. It takes a long time, so be prepared to really grind. You can start getting Stranite at level 25 if you wish, and may want some in order to make new armor. It requires Coal as well. Stranite can be found in the Coral Cave in West Athagos. Keep following the cave until you come across a room with blue ore nodes, and thats it. Shadow ore is great because it does not require Coal in order to make ingots. Tanpe. If you leveled Alchemy via Tanpe, turn it all into bowstrings and throw them in bank. I eventually needed over 1k bowstrings to level Carpentry 40-55. If you have a lot of cotton from Farming, feel free to turn it into whatever you want. I made robes and bandages. You *can* start making stuff out of silk at level 15. However, its drop rate was bad from the crabs in the Coral Cave so I just made some robes with it and stuck with cotton until 25. Jute. 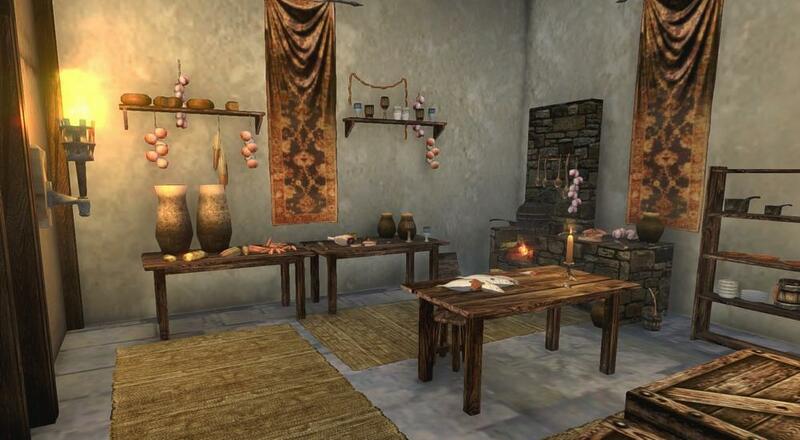 If you have Jute from leveling Alchemy, now is the time to use it. I made some good robes then used the rest on bandages. Spruce. Hold Shift + Ctrl and you will see it basically everywhere. Oak. I got it from around the pond in West Athagos. Evark - there are 3 spawns in West Athagos, and one in Yorkhill near the player housing and Jute spawns. Its a slow grind. At 25 you can get Pertica in Bal Sardan, but it was so slow to cut a tree down that it proved much faster for me to stick with Evark. There are now Palms at lvl 35 on an island in The Blue Sea, and I have heard they are great to level off of. I used Deadwood in Goldon, and thankfully there are now more spawns of it. However, it may be better to level woodcutting via Palms and save the wood for leveling Carpentry. I have not tried it as Palms did not exist at the time, so I suggest trying whichever one you think would be better.